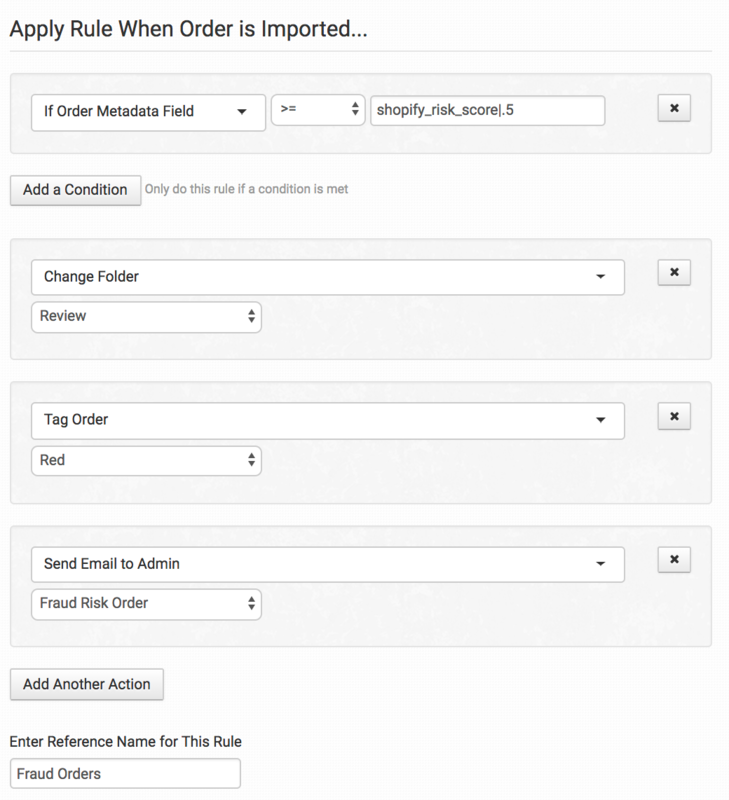 Shopify has a risk score and recommendation system that can warn you about fraudulent orders. 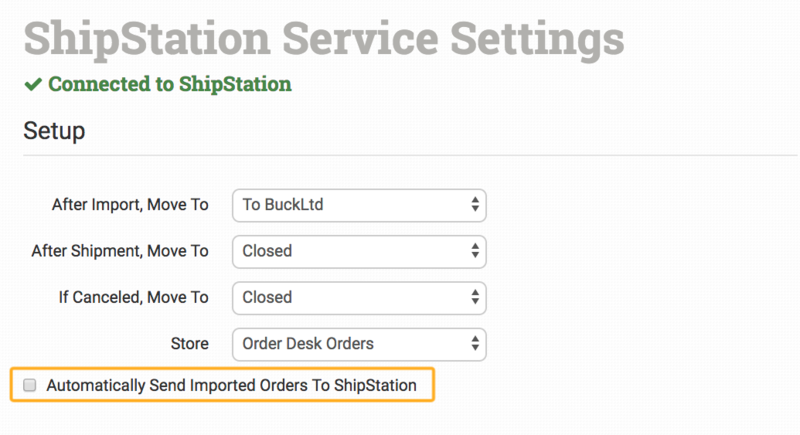 Most merchants want to automatically send their orders for fulfillment as soon as they are placed, but if you want to first check for and filter out any high risk orders, you can do so with Order Desk. 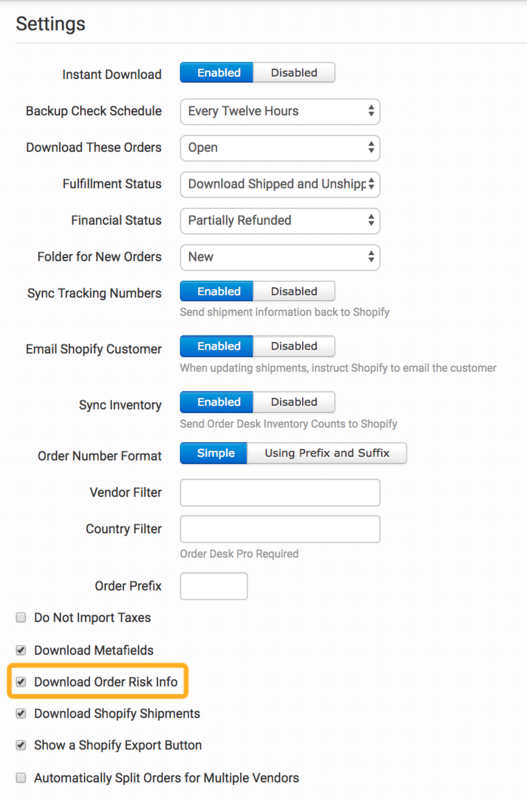 This allows you to set any potentially fraudulent orders aside while everything else is still automatically sent for fulfillment. 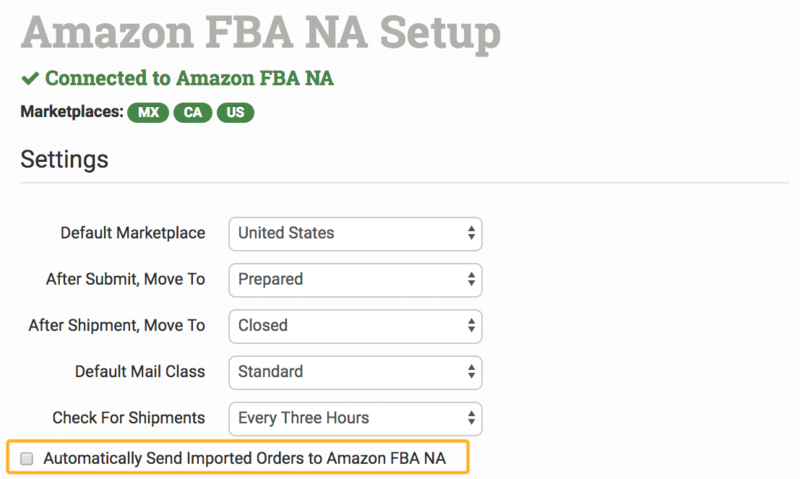 Setting this up will depend on your existing order workflow and how you want to handle high risk orders. As with most aspects of Order Desk, this process is customizable and can be tweaked to meet your specific needs. 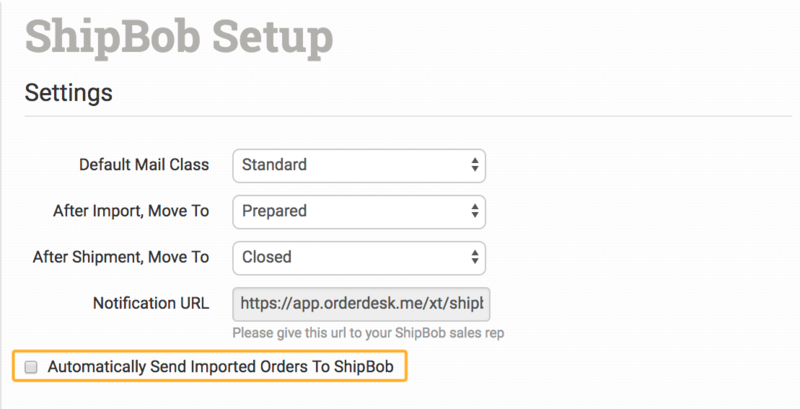 This guide will go over the steps necessary to bring in Shopify's risk info with your orders, where to find that info, and how to make sure you set aside just the orders you want while the rest of your orders are still able to move through the app immediately and seamlessly. You will first need to bring in the Shopify risk score with your orders. To do this, go into your Shopify integration settings. 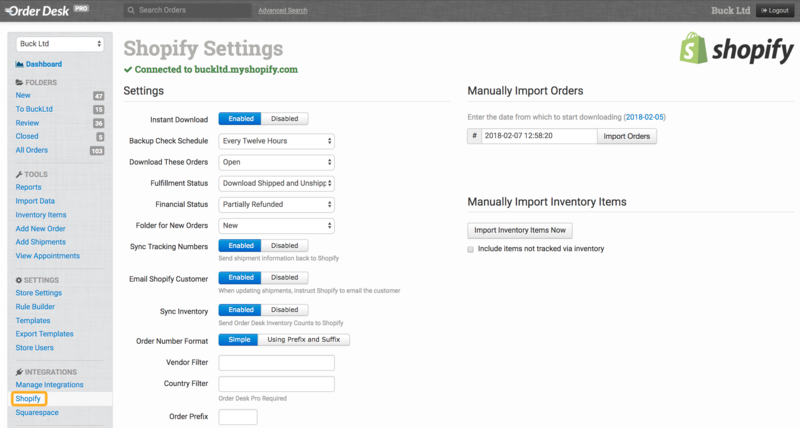 In the left sidebar, look under the Integrations menu and click on Shopify. Scroll to the bottom of the settings and enable the Download Order Risk Info option. This will not add risk related info for orders that have already been downloaded. It will bring in the risk info for all Shopify orders moving forward. 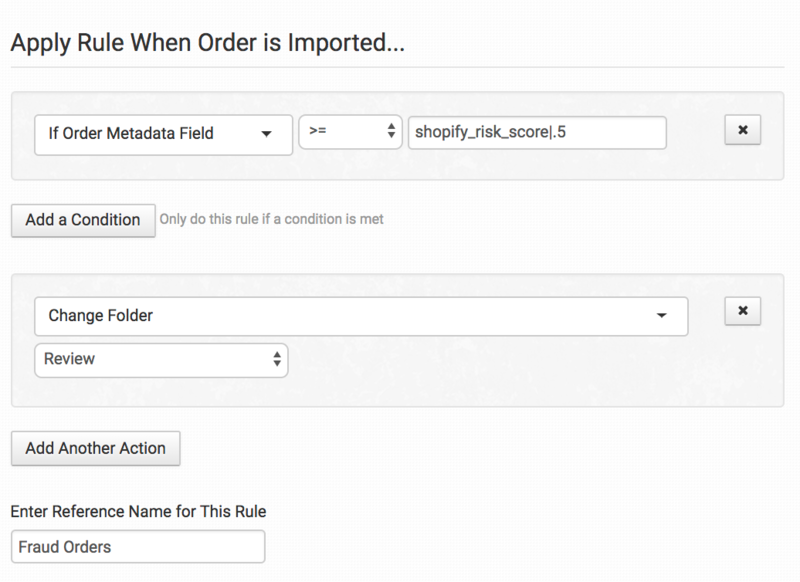 Once enabled, Order Desk will pull in any risk information from Shopify on potentially fraudulent orders and will store it in the Order Metadata. Order Metadata can be found at the bottom of the order details page. If Shopify determines that there is no risk, the risk score will be 0 and there will be no further recommendations or messages from Shopify. However, if anything about the order is suspicious, Shopify will assign a risk score between 0 and 1 and provide more information. The higher the score, the more suspicious the order is. In most cases, they'll include a message about why the order may be fraudulent and a recommendation to investigate or cancel the order. If you haven't already, create a new folder for any orders that will need to be set aside for review based on Shopify's recommendations. For instructions on creating a new folder, please read the Working with Folders guide. Head into your Rule Builder. You'll find it in the left sidebar under the Settings menu. If you don't have any rules yet, you can move on to the next step. If you do have rules, make sure none of them are automatically sending all orders (or all Shopify orders) to a fulfillment service or sending out a dropship email. 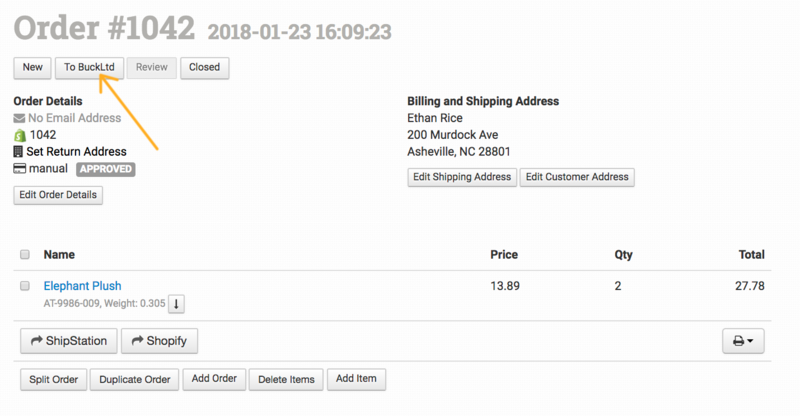 If you do have any rules doing this, you will need to add a condition that prevents any of the potentially fraudulent orders from being automatically sent for fulfillment by a rule. 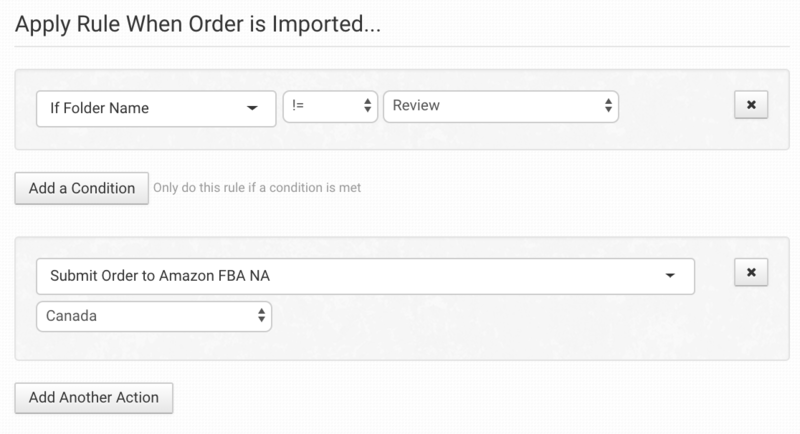 If your rule is only submitting orders from a specific folder, this condition isn't necessary since the risky orders will have been moved into the review folder and won't be in the folder the rule is looking at. If you choose to set up different rules than this guide suggests, you may want to come back to this step after everything is set up to make sure the conditions you choose to work with don't conflict with each other. Now that you've made sure your integrations and rules aren't going to pull or send any orders in the review folder, it's time to create the rule that will move orders into this folder. Shopify uses a percentage scale between 0 and 1 to indicate how likely an order is fraud. The closer the number is to 1, the more likely the order is fraudulent. Most merchants choose to set their threshold at 0.5 or greater. You are ultimately responsible for reviewing the orders in your store and preventing fraudulent orders from being fulfilled. Shopify's general guidance is to review orders with a risk level greater than 0.5. You may want to adjust this level in your rules as you see how their scoring system works. In your Rule Builder, create a new rule for the Order is Imported event and click Continue. Select the Change Folder action, and choose the review folder you created earlier. Create a reference name so you'll know what the rule is for and add your rule. Feel free to add other conditions if you have any other special circumstances (such as if the order total is over a certain price point). You may also want to add additional actions such as tagging the order red and sending the admin an email notification about the order. For more information on working with email templates, please see this guide. You will want this rule to run before any other rules or actions take place when orders are imported. That way it will move any high risk orders into your review folder immediately before any other rules start to run. If you decide to cancel the order, please refer to our Canceling an Order guide for more information about how this works in Order Desk.